Pleased to announce that the ANC Award for Architectural Acoustics, Education Buildings was won by the fabulous Wallscourt Farm Academy, Bristol. Why was this project so special? Years of research and project experience have enabled us to develop a list of design criteria for the acoustics of open plan spaces. By working closely with the project architect, NVB, we were able to successfully apply these principles to produce a highly functional and usable space. We have also remained in touch with the school, so to further learn how the building functions over the next few years. Wallscourt Farm Academy is seen to be a fine example of how to create an inspirational educational environment through an understanding of the requirements and characteristics of an open plan space. Our work benefited from attending and observing the behavior and workings of various different open plan schools, as well as through data analysis from on-site measurements and CATT Acoustics models. 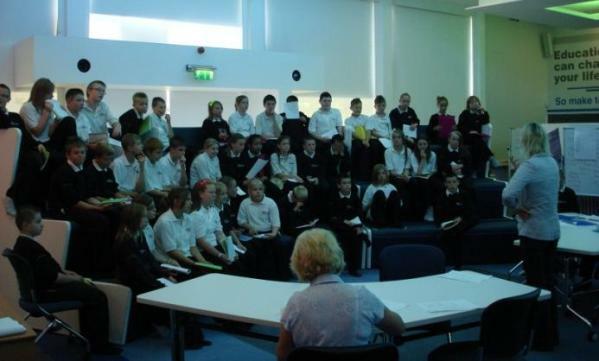 The question is, is it the teacher or is it the environment that governs pupil engagement? As a result of this question, open plan learning has been on our agenda for many years. Simplistically, if you remove the walls between teaching spaces, there are no longer any tools to control the acoustic separation between teaching spaces. This is why a quick web search or attending an acoustic conference will have you inundated with the acoustic issues relating to open plan spaces. However the photograph above clearly shows that open plan can be inspirational and highly beneficial. What If We Remove The Walls? We see that there must be something better than the square and rectangular classrooms that our children, ourselves, our parents, grandparents and so-on were taught in. Hence we believe in open plan learning and have therefore attempted to change the design of these spaces. The removal of walls means that we have to focus on STI as a key design parameter, and on communication as our tool to ensure that the open plan spaces are correctly designed. Our logic being that if the acoustic design is not bought into, it will not be implemented, resulting in a space that is not fit for purpose. The illustration below highlights the main factors effecting STI i.e. ‘enhancing the spoken voice’, left side - yellow, and ‘reducing unwanted noise’ right - blue. The diagram provides a range of design tools with respect to open plan learning/teaching, and is used throughout our design reports. Of vital importance in this consideration are: distance (between pupils and teacher), enhancing the spoken voice, reverberation control (screening and layouts) and also providing quiet spaces.